As Americans' fascination with guns grows, so, too, does the market for protection against all those flying bullets. Texan John Adrain has introduced an upscale sofa with cushions that can stop up to a .44 Magnum fired at close range, and is now at work on bullet-resistant window blinds. Another company, BulletSafe, recently touted its $129 baseball caps (with protection against the same bullets, but only in front)—though the company admits the cap won't prevent concussions. The Colombian suit and vest designer Miguel Caballero offers an array of bullet- and knife-resistant selections, made with Kevlar and Dyneema, which are also used by clothiers BladeRunner and Aspetto (maker of "ballistic tuxedos"). Notorious French derivatives trader Jerome Kerviel was fired in 2010 after his employer (Societe Generale bank) discovered that he had made unauthorized trades worth about $55 billion and then, by forgery and fraud, covered them up. In June, however, Kerviel won a wrongful-discharge case when France's Court of Cassation concluded the bank had "no real and serious" reason to fire him. Actually, the court ordered the bank to pay Kerviel about $500,000 in "performance" bonuses, based on the profit that his rogue trades eventually earned. Even though the bank had spent the equivalent of $5.5 billion unwinding Kerviel's trades, they still made money (because, before the world economy collapsed in 2008, the derivatives business was very good). • Ronnie Music Jr., 45, won a scratch-off lottery prize last year of $3 million in Waycross, Ga., and must surely have thought he was on a roll—because he soon flipped the money into a Georgia methamphetamine gang. The "bet" went sour, and he now faces decades in prison, as he pleaded guilty in July to drug trafficking and firearms violations after his associates were found with $1 million worth of meth and a load of guns. Montpelier, Vt., has one solution to America's well-known problem of ignoring infrastructure maintenance (and the high cost of asphalt). While other cities and states merely delay needed road work (though with harsh consequences to drivers), Montpelier has begun to unpave some of its roads, converting them back to cheaper, annoying gravel and dirt (and inevitably, dust). A recent report by Montana State University researchers expressed surprise that so many governments are choosing this option. • A Fargo, N.D., fire official said in July his crew had responded at least twice to alarmed-citizen phone calls to go help a man obviously homeless, covered in a blanket on a park bench, who seemed not to be moving. The First Lutheran Church later explained that the "man" was just a statue—their idea of Jesus as a homeless man—and its Canadian designer said versions of the statue had been placed in several cities, including Toronto and Detroit. Almost half of all produce raised by U.S. farmers is thrown out before it reaches a consumer's plate, and though there are several contributing explanations, the most striking is American eaters' "cult of perfection." "It's about blemish-free produce," said one farmer, e.g., "sunburnt cauliflower" or table grapes not quite "wedge-shaped" enough. America's "unyielding cosmetic standards," according to a July report in The Guardian of London, even means that much of the annual $160 billion worth of imperfect food is simply left to rot on the vine, or sent directly to a landfill, because farmers anticipate retailers' reluctance to stock it. In July, the U.S. Fish and Wildlife Service announced plans to keep black-footed ferrets in northeastern Montana from dying out—with drones that shoot peanut butter M&Ms (coated with a vaccine). Before the drones, there were too few ferrets to justify, economically, hand-delivering the candy. The membership of the Westerly (R.I.) Yacht Club voted in June to retain the club's men-only admission policy, which some members told a Providence Journal reporter was necessary to preserve the club's "family atmosphere." Apparently, according to the report, they feared being tempted at social events by having unmarried women around (as "full" female members, instead of the currently allowed "spousal" members). • The Chessington (England) World of Adventures theme park, after upgrading its authentic jungle experience, nonetheless had to post a noise restriction in July because some patrons apparently cannot resist the urge to do loud Tarzan impressions, which officials said "confuse" the monkeys. Christopher Wade, 55, was arrested in Nashville, Tenn., in July after police tracked him to his home, where he was found already in bed with a female mannequin shortly after stealing it from the Hollywood Hustler store. The mannequin was wearing a brown wig, a pink spandex dress and rhinestone stilettos. • As part of the Taste of Buffalo (N.Y.) food festival in July, competitors from the Major League Eating organization were offered a shot at the Kale Cup, with a $2,000 prize for the most kale eaten in eight minutes. The very healthy Gideon "The Truth" Oji won, downing 25.5 bowls. 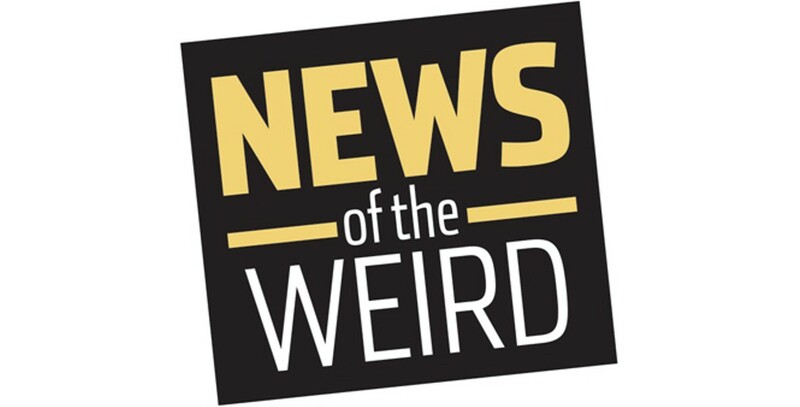 Thanks this week to Mel Birge and Robin Daley, and to the News of the Weird Board of Editorial Advisors.